Social movements and grassroots leaders from across the Americas, Africa, and Asia came together in Nairobi to organize and participate in three full days of strategic meetings of the Social Movement Working Group, which surrounded the four-day International Strategy Meeting on ESCR and ESCR-Net General Assembly on 29-30 November and 5 December, 2008. The gathering supported mutual-learning amongst social movements, strengthened solidarity and support between social movements and NGOs, and organized solidarity visits to stand in support and learn from Kenyan social movements in their struggle. The Social Movement Working Group also developed common strategies and plans for collective work, and emphasized ensuring the inclusion and centrality of social movement leadership in ESCR-Net. The discussions were animated and grounded by the decades of strength and experience of participants from diverse and rich backgrounds as organized small-scale farmers, rural and urban poor, indigenous, Dalit, women and workers' organizations, fisherfolk, pastoral people, and the HIV/AIDS positive. Discussions were then held to identify and map out struggles shared by all. These common struggles were diverse, including the privatization of land, water and other natural resources; displacement and dispossession; the lack of meaningful participation within governments, global institutions, and broader civil society; the lack of recognition of the rights of family farmers; the criminalization of dissent; and the denial of access to justice and inability to make economic and social rights justiciable. Ongoing discrimination and violations of cultural rights, as well as the systematic attempt to destroy mobilization and disempower community organizations were also recognized as common struggles. The group then collectively began to analyze and map out root causes of these common struggles. The lack of respect for diversity; corrupt or misaligned representative structures; ongoing forms of colonialism, commoditization and capitalism were all emphasized. Equally stressed were issues around the lack of political will, good leadership, accountability, and impunity. The lack of meaningful participation, and a misunderstanding or lack of information about human rights were also identified as root causes of the challenges faced by social movements across the globe. 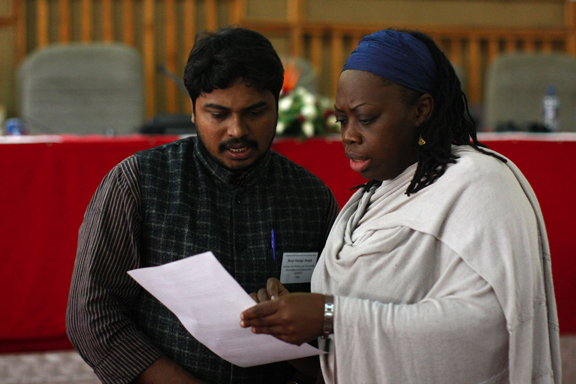 Participants then moved from analyzing their common struggles to exchanging effective and emerging human rights strategies to confront them. Strategic alliance-building by the Coalition of Immokalee Workers, leadership in international-level networks by the Movement for the Survival of the Ogoni People (MOSOP), public education, public mobilization and direct action by the Movimento Sem Terra (MST), the use of legal mechanisms by the Western Shoshone, video advocacy to document abuses and build awareness by the Comité de Emergencia Garífuna de Honduras were some examples of such strategies discussed. The day ended with a video advocacy training facilitated by WITNESS, with video flip cameras provided by ESCR-Net. On the second day, participants evaluated the efforts of the Working Group to date, and discussed models of effective collaboration in the build-up of an action plan. A strong consensus emerged over the need for more mutual-learning programs, especially when paired with Solidarity Visits, where participants can support, work with and learn from local movements very concretely in their everyday acts of defending human rights. Other effective ways to collaborate were also shared by the participants, including educating young people, the engagement of community leaders, training trainers in human rights (especially women), and creating an accessible manual on ESC rights and on effective social movement strategies to implement them. Notably here, various video interviews and recordings occurred throughout the sessions toward the aim of developing this manual. Participants further discussed ways of engaging the wider Network in their action plan, the creation of guidelines for ESCR-Net urgent actions, and ways to take up leadership positions in the Network, through for example more active roles in the working areas and strengthened representation on the Board. 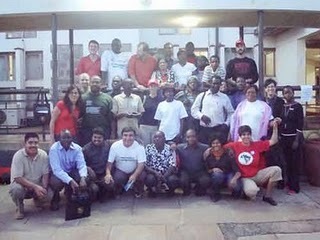 The Social Movement Working Group then participated in Solidarity Visits, led by Kenyan social movements. Participants visited three communities: Korogocho, Kibera and Mukuru Kwa Ngenga/ Kwa Ruben. These visits allowed participants to stand in solidarity with and support local groups by sharing successful strategies, and to learn from local day-to-day struggles in Kenya over the plight of women and the disadvantaged, struggles over land and housing, and deep health disparities. Following these two intense days of sharing experiences and building a collective voice, the Social Movement Working Group then joined the International Strategy Meeting on ESCR and General Assembly. Groups participated actively in the different thematic Working Sessions. Social Movements also led a three-hour Plenary, entitled Building a Bottom-Up Network of Mutual Support and Collective Action. This plenary allowed all participants to identify concrete steps to strengthen collaboration among members, including through human rights trainings, social movement exchanges, communications materials, and support for local campaigns. During the General Assembly, three social movement representatives were elected to the ESCR-Net Board, one example of the strong leadership role movements in the Network took up in Kenya. On the seventh day, the Social Movement Working Group together with the Secretariat organized a final strategy session, which consisted of an evaluation of the Strategy Meeting, the formation of new structures for leadership in the Network, and new issues for the WG to consider together. Individuals volunteered to be social movement focal points for each of ESCR-Net's areas of work to share information and fully represent grassroots concerns in them. Participants identified three areas of focus for future collaboration. Communication was first, so that groups can remain closely in contact, distribute relevant information and build an effective network of emergency support. Communication techniques would potentially incorporate the use of video, multimedia, newsletters, new listerves, and SMS text messaging. The second area of focus was training and exchanges, directed to communities and/or potential trainer, and finally the launch of a global campaign was the third area of focus for the more medium-term future. Social movements and grassroots leaders from across the Americas, Africa, and Asia came together in Nairobi, Kenya in 2008 to organize and participate in a full of strategic meetings of the Social Movement Working Group to support mutual-learning amongst social movements, strengthened solidarity and support between social movements and NGOs, and to organize solidarity visits to stand in support and learn from Kenyan social movements in their struggle.